Who knew, listening to Transatlanticism when it first came out five years ago, that it was the first chapter in a three-album story arc, one that would end in a tragedy fit for the Bard himself? In Act I, the band established itself as the Next Big Thing; it wasn’t that Transatlanticism was their first record, or even their first good record… simply that it was one that launched them to indie rock stardom and set the blogs abuzz. And the album still sounds fresh, alive with excitement and the possibility of new ideas. And if that’s the album where they took off, it’s Plans– Act II of the tragedy– in which you can really hear the band soar. 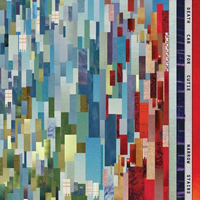 Even if it’s just a refinement of a sound they’d been honing for years, it’s still a moving, memorable album, finding Ben Gibbard coming into his own as a songwriter and the band playing with a confidence they’d never exhibited before. If they sounded wide-eyed on Transatlanticism, they sounded courageous on Plans, expanding their emotional and stylistic palette and coming up with a terrific set of songs. And now, with Act III– the blandly-titled Narrow Stairs– they sound neither wide-eyed nor courageous; this time, they simply sound bored. Perhaps it’s because they’ve bumped up against the boundaries of their familiar sound and they just don’t know where to go from here. Whatever it is, Death Cab has never sounded so lifeless and staid. Which is not to say that it’s a bad album, or even that they’re totally out of ideas. In fact, it’s the most expansive thing they’ve ever done, but, ironically, it also feels like their most minor achievement. They take some risks here and there– especially in the album’s last half– but never do they find the kinetic energy that made Transatlanticism memorable, or the soulfulness that elevated Plans tracks like “Soul Meets Body” or “I’ll Follow You Into the Dark.” Instead, this album is divided rather evenly between tenuous stylistic experiments and lifeless run-throughs of typical Death Cab fare– one that finds them trying a lot of stuff they’ve never done before, but never quite finding the edginess, the soulfulness, or the sense of play that marks their best albums. The whole thing is bogged down with mid-tempo rock songs that are warm and melodic, but not particularly hooky, and there’s no variation in texture or mood– or even tempo– to keep these songs from growing tedious, making for an album that’s never unpleasant but never very interesting, either. There’s nothing to distinguish mid-album cuts like “Cath…,” “Talking Bird,” or “You Can Do Better than Me” from other, better Death Cab songs– or even other, better songs from comparable bands. They’re simply more of what we’ve heard before, minus the spark of fresh ideas or real passion, or even the sharp hooks that Gibbard usually comes up with. And when they do break from their formula, the results– though often good– do nothing to fix the album’s biggest problem, which is its plodding lethargy. Opener “Bixby Canyon Bridge” sounds like it’s meant to be a sweeping, expansive opener, but as much as it just begs to explode with energy, it never rises from a simmer to a full boil. That song is followed by the eight-minute build-up of guitar-pop epic “I Will Possess Your Heart”– which, though well-composed and well-played, destroys any sense of momentum the album may have had. Later standouts like the muted soul of “Grapevine Fires,” or even the Pet Sounds flourishes of “You Can Do Better than Me,” would have been excellent palette-cleansers on either of the last two albums, but here they simply dig the band deeper into their mid-tempo rut. Not only are the performances here unusually limp and the production unusually stuffy, but Gibbard’s songs are unusually weak. Cliches abound (“You can do better than me/ but I can’t do better than you”), right down to the age-old story of a woman who breaks the singer’s heart by marrying the wrong guy (“Cath…”) and the creepy, stalker-ish lyrics of “I Will Possess Your Heart.” Gibbard’s metaphors often feel very forced– “you look so very defeated lying there in your twin-sized bed/ with a single pillow underneath your single head”– and even when he gets the lyrics right, there are no hooks to make them stick. It’s a beguiling album, for the sole reason that this band has been so consistent for so long that it’s unsettling to hear them phone it in here. Narrow Stairs certainly doesn’t find them imploding or making any tactical errors that can’t be corrected, but it does find their inspiration seriously waning, making a significant change of course urgently needed. And of course, that’s still entirely possible– perhaps this isn’t the final act of a tragedy, but the build-up to a glorious comeback story. One certainly hopes that’s the case– but even if it is, it doesn’t change the fact that this is the album that makes a comeback necessary, and, though not a disaster, it’s not a record that rewards, or even deserves, repeated listening.